How to trim segments from a Flash movie, and merge several segments into one? Tutorial - 13. How to trim segments from a Flash movie, and merge several segments into one? 2). After setting the output format, click the "Play" button to play the Flash movie. 3). Click the "Capture" button when you see the frame which you want to be the first frame of a segment. Now the "Capture" button will switch to the "Pause" button. 4). Click the "Pause" button when you see the frame which you want to be the last frame of a segment. Now the "Pause" button will switch to the "Capture" button again. 5). Drag to the position where you want to create another segment. 6). Do step "3-5" repeatly. 7). Click the button to stop capturing. All the segments will be merged and converted to one video file! How to download your favorite Flash SWF from any webpage? How to convert Flash SWF to AVI/XVID/DIVX/MPEG4 video? 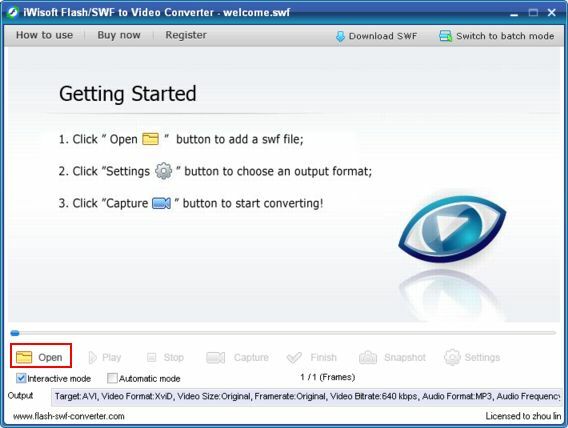 How to convert Flash SWF to MPEG, SWF to DVD compatible video? How to convert Flash SWF to iPod/iPhone/Apple TV MP4 video? How to convert Flash SWF to PSP/PS3 MP4 video? How to convert Flash SWF to Mobile 3GP video? How to convert Flash SWF to Zune video? 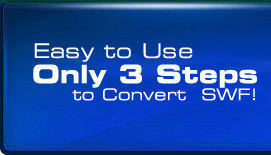 How to convert Flash SWF to WMV video? How to convert Flash SWF to Pocket PC/Windows Mobile video? How to convert Flash SWF to FlV Youtube video? How to convert Flash SWF to Quicktime MOV video? How to extract Flash SWF audio to MP3 file? How to convert Flash SWF to Animated GIF or BMP, JPG, GIF, PNG image series? How to add a watermark onto the output video? How to take snapshots from a Flash SWF file?